Lincluden’s Kids Have Won the Lottery – Funding Success for Popeye’s Park! Home Community Focus Lincluden’s Kids Have Won the Lottery – Funding Success for Popeye’s Park! Lincluden Community Centre Chairperson, Margaret Jardine, Centre Manager, Lynn Uygun and Caretaker, Bryan are joined by local councillors Andy Ferguson, David McKie and Ronnie Nicholson and the children from Lincluden Nursery. 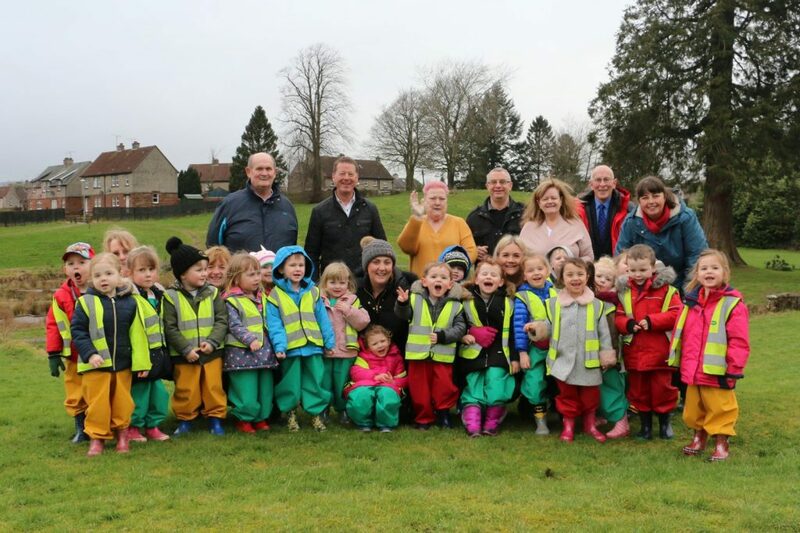 Lincluden Community Centre are delighted to announce that they have been successful in their application to National Lottery Community Fund’s Our Place initiative to develop an area of green and open space in North West Dumfries known as Popeye’s Park. Thanks to money raised by National Lottery players, this funding success of £375k will transform the community park into a rustic and natural play area for children. In addition to the new play equipment, the funding will also allow for the landscaping, planting of trees, renovating the pond as well as providing additional seating for the community. Popeye’s Park is an area of natural beauty and the park development aims to encourage children and families to spend time enjoying themselves in the landscape. Margaret Jardine, Chairperson of Lincluden Community Centre said: “I’m over the moon. The community has been passionate for a long time about Popeye’s Park and have wanted to see it returned to a space where local people can meet and enjoy family time together. We are so thrilled that the funding of £375k from the National Lottery Community Fund will transform our local park”. Lynn Uygun is the community centre manager. She said: “This is fantastic news. So many people have worked so hard over the last four years to get to this point, from the early sketches to the detailed plans and drawings, and from speaking to a few people to extensive community engagement with hundreds of people across our community. We’ve listened to what the community have told us, and we are going to deliver them the most fabulous park”. Cllr Andy Ferguson, a North West Dumfries elected member and Chairman of the Dumfries and Galloway Council’s Communities Committee said “It is such an exciting time for Lochside and Lincluden with over £1.5 million being invested in the area through Big Lottery Community Fund’s Our Place initiative. The last few months has seen exciting projects start that will make a really huge difference to the area”. Cllr David McKie, Chairman of Dumfries Common Good Committee and another North West Dumfries elected member said: “We are delighted to have worked with Lincluden Community Centre, partners and the community over the past four years to secure funding to help transform this common good park into what will become a major focal point for the children and families in the area”. Lincluden Community Centre is leading the project on behalf of the community and will work closely with Dumfries and Galloway Council to develop the consultative and users group “Friends of Popeye’s Park”, and on events, activities, marketing and promotion. o National Lottery Community Fund is the new operating name of the Big Lottery Fund. o Our Place is a five year place-based initiative from the National Lottery Community Fund. It aims to empower local people and organisations to bring about a massive and lasting positive difference to their neighbourhood. o Over the remaining six months, Our Place will work with and support projects in seven neighbourhoods in Scotland. o The National Lottery Community Fund is responsible for giving out 40% of the money raised by the National Lottery. o National Lottery Community Fund is committed to bringing real improvements to communities and the lives of people most in need and has been rolling out grants to health, education, environment and charitable causes across the UK. Since its inception in 2004 it has awarded close to £6bn. o Community Enterprise in Scotland (CEIS) is delivering asset-based community development work in Lochside and Lincluden on behalf of the National Lottery Community Fund. o Lincluden Community Centre is the common name of Lincluden Community Centre Management Committee, a Scottish Charitable Incorporated Organisation. o All press notices on Our Place must acknowledge funding from the National Lottery Community Fund.